Just in time for Christmas (if you’re quick), Richard Griffiths has released his annual “Season Highlights” package. 16 DVD discs, running at approximately 90 minutes per disc, adds up to a staggering 24 HOURS of highlights from the entire 2009 season for the bargain price of £25.99 (inc P&P). Regular users of F1Stockcars.com will be aware that Richard has provided us with fantastic videos all season, but these videos do not even begin to scratch the surface of what is available in the complete 16 disc 2009 package. 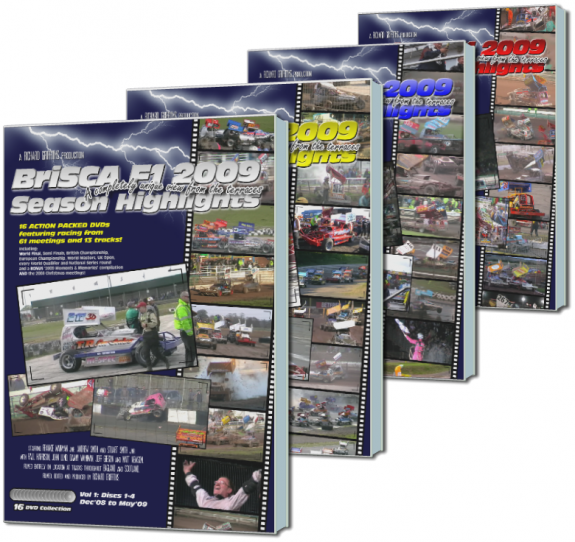 Highlights from EVERY race of EVERY meeting, running in ‘Fixtures List’ order, broken down into easily digestible chunks, allow the viewer to relive the entire story of the BriSCA F1 2009 season over a matter of hours instead of months. See how Andy Smith got himself onto the front row of the World Final grid, and then watch his amazing performance as he drove around the outside of Frankie Wainman Jnr to take the Gold Roof. Follow how the 10 most successful drivers of the year grabbed their entry tickets into the awesome National Series Shootout rounds to fight it out for the coveted Silver Roof. Take in the breath-taking achievements of Lee Fairhurst’s rise from White-Top rookie to European Champion. These and many more stories of the season, documented for posterity. Shot with a single camera with a unique “View from the Terraces”, over the years Richard has shown an uncanny sixth sense, to be pointing his lens in exactly the right direction at the right time, and capturing all the important moments in each race, and in doing so he manages to convey the action to the viewer with none of the confusion that can sometimes plague a badly edited multi-camera video. It’s obvious to anyone who has purchased past editions of Richards Season Highlights, that these Boxsets are a love and passion, and not made for profit. The purchase price of just £25 per Boxset, could not go any way towards reimbursing the cost of all the time and effort that clearly goes into the hundreds of hours of editing and more. So what are you waiting for… use the secured Pay Pal links below and grab yourself the prefect antidote to off-season blues, or the ideal Christmas stocking filler.